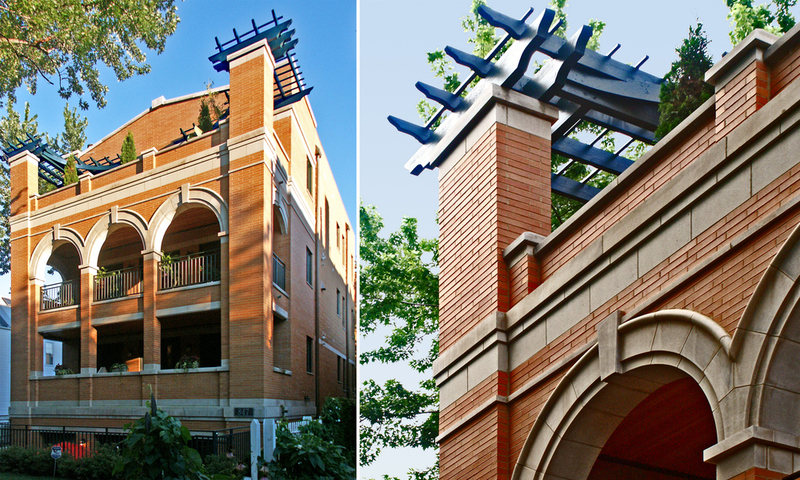 Honored with a 2004 Gold Key Award from The Home Builders Association of Greater Chicago and a 2002 Design Merit Award from the Association of Licensed Architects. The entire street facade of this urban infill building is allocated to generous private terraces directly accessed from the living spaces, expressed with brick piers and stone arches topped by a curving wooden pergola. Two units were stacked over the garage, spanning the width of the building at the rear, with their own private porches overlooking the surrounding yards.